It’s been a long time comin’, but I’m here now. And I’m ’bout to set your… computer on fire (I’m sorry, I just had to). 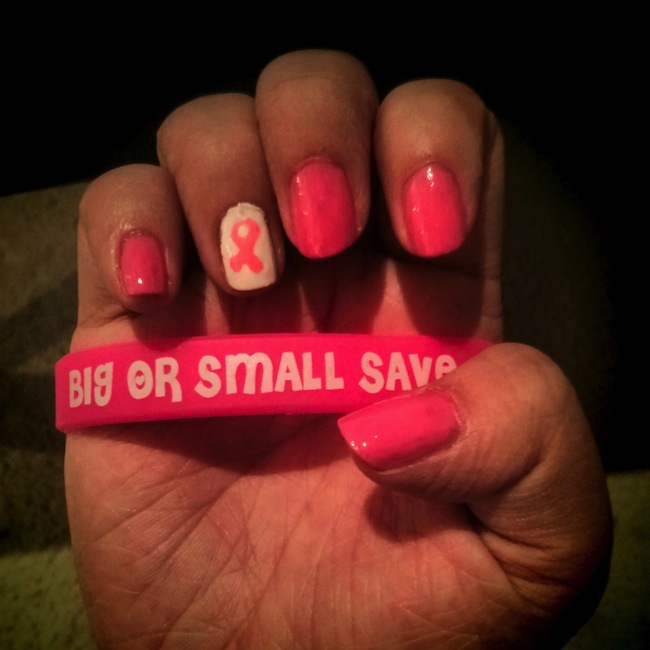 It’s been October for some time now, and in honor of that, I came up with a Breast Cancer Awareness manicure! This manicure is quick and easy, and is actually from last last last Monday, so I’m sorry it’s just coming out now. Apply a base coat and paint all nails, except the accent, dark pink. Paint the accent nail white. Wait for the white to dry completely. Take your palette, a plate or a lid, and add a few dabs of the light pink polish. Turn your hand towards you, where the cuticle is facing away from you. Using the dotting tool, dab it into the light pink polish and make an “X” shape on your nail. Once that is done, connect the top of the “X” to create the pink ribbon. If your curve connecting the line looks too thick and closes the “gap” in the ribbon, wait for it to dry some and then apply a small dot of white polish. Wait for the design to dry completely and then add a top coat. I’m sorry I don’t have pictures to accompany this tutorial- it’s impossible to do it with a single person, but hopefully my instructions are clear enough if you decide to try it out. If the there are any questions, feel free to comment and I’ll try to help you out! Yep! It’s kind of a big deal here, and at my school. Not very many kids have actual school spirit, but they all wore pink on the designated Breast Cancer Awareness day. Really?! Wow, that’s awesome. Really, really cool, it’s so important. Here, honestly nobody knew. I mean, I’m sure some people knew, but ones I met, nope. And I actually think that the Breast Cancer Awareness mani is not silly, it can generate buzz and even a little bit attention, always a win.